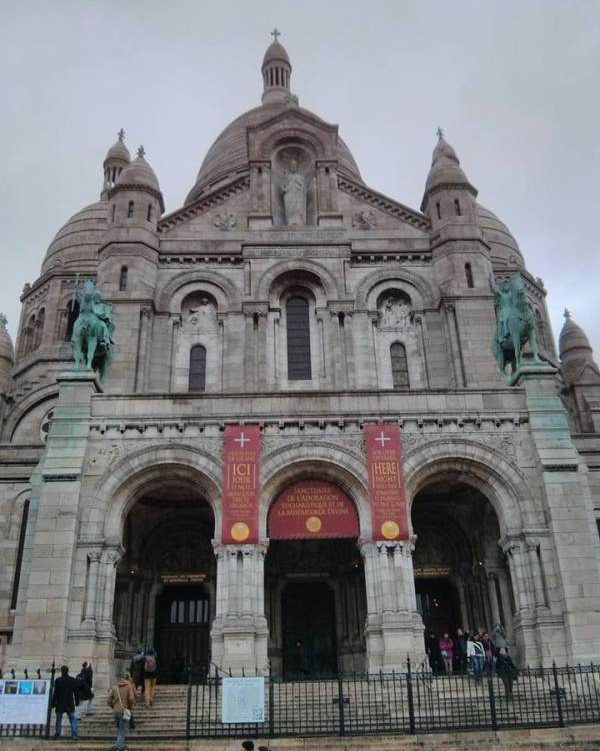 I am back from Paris, where this year’s European Legacy Grand Prix was held. It was an outstanding weekend for me, leaving me with my first GP Top 8. But before getting into this, please allow me to introduce myself. I am Philipp Schönegger, a Legacy enthusiast from Austria. I’ve been playing Legacy for about three years, but didn’t play it really competitively before GP Strasbourg, where I finished Top 64 without any byes. After having dipped into this perspective of Legacy I kept on testing a lot, which rewarded me with various top finishes at smaller tournaments in Austria and Italy. With GP Paris on the way I kept on testing the same deck I had been playing for about two years now, Miracles. This blue-white-red menace has conquered a piece of my heart ever since. Basically this list plays nothing too fancy. It is very grounded, at least when talking about the selection of cards. But this does not make a list good; it’s the very well thought out combination of those cards that make this deck work like greased lightning. Many other players tended to not play Ponder, which is a big mistake, as this card is not only at its best in Tempo and Combo decks, but also in Control ones. The ability to dig for what you need and delaying unneeded Miracles by a turn or two fills an important role in the deck’s concept. With 2 Ponder this deck reached the 10 cantrip mark, which shows how consistent this deck should be doing what it is meant to – and there is nothing less you want your deck to do at a big tournament. You want to have the ability to crush your opponent without giving him the opportunity to fight back, and you want to be able to do this repeatedly and consistently. With this increased consistency you can regularly counter everything relevant, wipe the board for one white mana, and await your deck to do this over and over again. It’s this basic correlation between consistency and power. Abusing the maximum amount of power with the highest level of consistency is what makes this deck what it is, and makes it what I believe to be the best choice for the modern Legacy metagame. Other than that it would take a whole new article to discuss any individual choices, as those imply a higher background knowledge about the deck and the metagame as a whole. But the focus of this article should be the Grand Prix itself – so let us finally begin. We arrived on Thursday, granting us with spare time to visit the city and/or test Legacy. 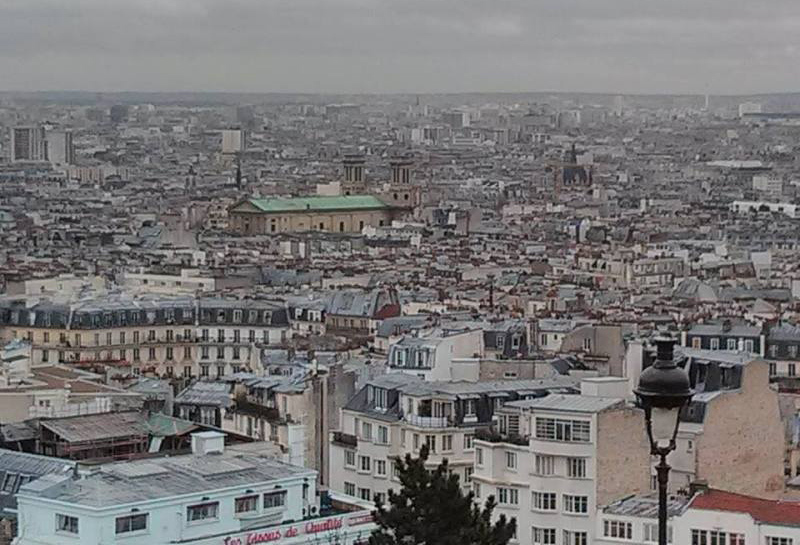 We skipped the Eiffel Tower, but visited Sacre Coeur, which rewarded us with a splendid, yet rainy view of Paris. Soon after spending a few hours in the city we retreated to our apartment and began playing Magic. As all the serious testing had been done beforehand, it was more of a relaxed atmosphere. On Friday we arrived too early at the site, which forced us to wait outside in the rain. As soon as they let us in we registered for the first Trials. Before those began I made my way to the judge station, asking for the Head Judge, in order to get my many alterations legalized. He deemed one of my Islands illegal, which I replaced with another altered one. After my deck was confirmed to be totally legal I tried my luck in the Trials, but I didn’t play the serious list above, but rather a Stoneforge Mystic-based Miracles list. Despite not winning a Trial the list didn’t work all that bad, but was clearly inferior to my main list. Yet this deck was capable of one pretty cool move that I was able to pull off two times during the Trials. You have to have a Stoneforge Mystic in play, a Batterskull in hand, Terminus on top of your library, a Sensei’s Divining Top in play, and a field full of opposing creatures. What you do is easy: activate Stoneforge Mystic, and put Batterskull into play. In response to the Living Weapon trigger you flip your Top, triggering the Miracle mechanic for Terminus, and cast your Terminus, wiping the whole board. You then resolve the triggering Batterskull, leaving you with a powerful attacker on an otherwise empty battlefiedl. Well this trick was fun, but nothing more. We left the site at night, without winning any byes, but eager to play on Saturday. I wasn’t even able to scrape together a bye or two via Planeswalker Points, as I hadn’t been able to play Magic for quite some time, and big Legacy events are rare in Europe. So we finally ended the last day before the GP with some more Legacy, as usual. On Saturday we stormed the site pretty early again, getting ready for the competitive Legacy we have all waited for. Some of our group had byes, but I neither had them, nor did I need them. I defeated Axel in two quick games. He was playing High Tide, but was simply unable to combo through my high density of countermagic. These games were pretty uneventful. The only decision here was when he Force of Willed my Counterbalance. He did not reveal which deck he was on yet, so I wasn’t sure whether or not protecting my Counterbalance was worth it – as this card isn’t at its best against OmniShow. But when I saw that he pitched Merchant Scroll to his Force of Will it became obvious, and I played accordingly. This match against Julien didn’t go as easy as the first one did. His Merfolk deck posed quite a serious threat to my deck, as uncounterable and Islandwalking creatures are annoying. Yet I stabilized at 1 life in game 3 with Counterbalance and Top in play, and a 2 and 3 converted mana cost cards on top of my library, with Red Elemental Blast in hand (which I had to use against Llawan, Cephalid Empress at one point). Sadly enough, I had to face fellow Austrian Christopher Cerny this round. In game 1 a timely Entreat the Angels sealed the deal, while his mulligans didn’t really help him win the second one. On turn 1 I deployed a Sensei’s Divining Top, which lead him to extend his palm to his face, and sigh in disbelief. Obviously his deck was pretty weak to mine, and I was pretty sure he was on Elves. On his turn he played Deathrite Shaman, which I let resolve only to slam down Counterbalance on turn 2 and win from there. Game 2 didn’t play out much differently, and he lost despite having multiple Null Rods. In the first game Miori managed to cut me off of my white mana sources, and held me off long enough to steal a quick victory. In both of the ensuing games I managed to stabilize at 1 life with the CounterTop lock. Her deck didn’t play Sulfuric Vortex or Vendilion Clique – so the game was won from there, only to be brought home by Snapcaster beatdown. Nicolas’ deck couldn’t handle a fast Entreat the Angels in game 1, which led to a quick victory. I game 2 I struggled to find any business, and he quickly overwhelmed me. In a deciding third game I got rid of his Aether Vials with Disenchant, which enabled me to play the Jace-game, which eventually lead to me having infinite cards in hand, and him with none. Game 1 saw us both having Jace, the Mind Sculptor, but mine was accompanied with the CounterTop lock, which ultimately lead me to victory. In the second game I tried to resolve an Entreat the Angels on turn 3 ( which resolved), but my successive one was Force of Willed. I did beat him down with this Angel plus one Vendilion Clique. Soon before he died he resolved a Stoneforge Mystic, brought his Batterskull in and began the damage race, which was in his favor, due to his own Vendilion Clique killing mine, and the lifelink from his Batterskull. At 3 life I had to chump block his Germ token with my Angel token, but managed to wipe the board afterwards with Terminus, and locked him out with Counterbalance. Later on I got another Clique down, and his only outs at this point are Abrupt Decay, but as he had played one already I decided to go for the risk, as I could handle his potential Snapcaster Mages with my Red Elemental Blasts. He indeed topdecks Snapcaster Mages on the last turn possible but couldn’t get rid of my Blasts due to the CounterTop lock, and Vendilion swung in for the win. In the first game we do nothing but deploy blue fetchlands, both afraid of exposing ourselves to opposing Stifles. As soon as his Stoneforge Mystic entered play (being cast with Tundra and Volcanic Island), I assumed that I was safe to fetch, which I was. His creatures were killed one by one, followed up by a quick Jace. In game 2 he had a quick start, but folded to my overload of removal, which enabled me to shut him out pretty fast with the ensuing CounterTop lock. Our match took place in the feature match area (although not on camera). During the first game he managed to bring 3 Griselbrands onto the battlefield. The first one was removed from the game with Swords to Plowshares in response to the “Draw 7” ability being activated by Loic with his Griselbrand. As he Reanimated him he was unable to activate the draw trigger again, and had to let it go. The second Exhumed Griselbrandfell prey to Terminus, as did the third one, which was Show and Telled in to play. At two life he cracked his fetch, went to one life, cantripped and passed the turn I decided to go for it. I cast Snapcaster Mage at the end of his turn. He cast Daze, I played Force of Will, and we were off to the races. In game 2 he led with a discard spell, taking away my Rest in Peace. Stripped from hate pieces I just countered everything he had with my overload of countermagic until I assembled the CounterTop lock and started to beat him down with Snapcaster Mage yet again. I was pretty excited for Day 2, as all I had to go was 4-2 to ensure a Top 8 birth, which didn’t seem all that hard with a deck like this, and the metagame like it was shaping up. There seemed to be no bad matchups left in all of the room. Had I known how wrong I was? On Sunday I had to leave the hotel early due to Day 2 starting at 9:00am, and as I was the only one from our group still in contention I went there alone. While I made my way to the Grand Prix I saw many native Frenchmen return home from a night full of parties. I couldn’t quite suppress a smile. As soon as I arrived at the site I bought new sleeves and prepared for another day packed with Legacy. In the game 1 I Pondered, and shuffled and drew. My Brainstorm didn’t find me any action either, and I quickly died without even interacting with his Tarmogoyf and Deathrite Shaman. In the second game he had Chains of Mephistopheles and I had no access to my outs (1 Disenchant and 2 Engineered Explosives). So I Brainstormed in response to his Hymn to Tourach, getting me hellbent, but putting Entreat the Angels and Terminus on top of my deck. His army was killed, and my ensuing Angels ended the game pretty quick. In the third game I Spell Pierced his Chains of Mephistopheles, leaving me with Disenchant as an answer to problems to come like Choke, Sylvan Library, or more Chains. Later in the game I Entreated for power worth half of his life, leaving Counterspell up as protection. He did not draw Maelstrom Pulse, which would have won due to multiple Pyroblasts in his hand nullifying any of my Counterspell effects. With an undefeated score it was not surprising that my next match against Gregorio took place in the feature match area. As this matchup is a very good one I had no problem landing Jace, the Mind Sculptor after I had cleared his board. He could not really recover from all the card advantage I accumulated with said Jace. In the second game he fell for my bluff of having no other lands in hand, which made him Pierce my Engineered Explosives with 3 lands up, right after I disenchanted his Null Rod, which made him moan in surprise and disbelief. After the board was wiped he lost to a Jace, the Mind Sculptor and Entreat the Angels (as you can see in the clip above, the coverage changed away from this match in a hurry as things spiraled out of control). Sitting at 11-0 I was paired against Maxime Gilles, the other undefeated Miracles player, who had defeated Paulo Vitor Damo da Rosa the round before, who had also been undefeated with Miracles. Maxime’s deck featured main deck Red Elemental Blasts, which made this matchup incredibly hard for me. Both games went incredibly fast, as his Sensei’s Divining Top was providing him with the card quality advantage I would have needed to keep up with his fast play of business-spells like Counterbalance and Jace, the Mind Sculptor. Game 2 went in a similar fashion, as he countered my Top and protected his own, and I soon fell behind and lost. As I was looking as my pairings I was a little disheartened. It had me playing against Paulo, who had a mini-Stoneforge package in the sideboard. The first game was a rather lengthy grind which ended with Paulo resolving Jace, the Mind Sculptor and me falling behind very soon. In game 2 he took a mulligan to four, but still won the game due to two consecutive Stoneforge Mystics, backed up by two Jace, the Mind Sculptors, while all I had was Sensei’s Divining Tops, Ponders and Brainstorms. Having a score of 11-2 forced me into winning both of the following matches. On the upside though I knew for sure that there weren’t any other Miracles on top of the scoreboard. In the first game I lost to a 1-of Stifle in his main deck. Stifling my fetchland disabled me from casting enough Counterspells, which lead to me quickly being killed by Griselbrand and Emrakul. Hilarious. The second game was rather easy, as I had an ton of counters and Sensei’s Divining Top in play, which made me draw the best cards only, while he draw blanks. Snapcaster brought the game home. In the third game he mulled to five, but still managed to chain 3 consecutive Show and Tells/Sneak Attacks, of which all three were countered. He was then locked out with CounterTop, after I Flusterstormed his Through the Breach. So now it was down to the win-and-in match. My opponent was a friend of a friend, which didn’t make it easier. What did make it easier was that he was on BUG Delver/Team America. Feature Match again. The video coverage of this match starts in Game 1, at the 6:41:40 mark of the WotC Twitch.tv stream, embedded below (just click play). In game 1 I was easily able to resolve a Jace, the Mind Sculptor, and then started beating him down with Angels, but I had to eventually wipe the board with Terminus, due to his threats. Nonetheless, my Jace stayed alive, and I buried him in card advantage. He didn’t concede for a while, so it took some time until I found some creatures to kill him. In game 2 he had a great start with a lot of creatures, while I struggled to make my early game developments. I did manage to wipe his board with Terminus, but Liliana killed herself in order to ultimate me – leaving me with 2 lands, 1 land in hand and a Sensei’s Divining Top. Soon after Jens resolved a Winter Orb, which slowed both of us down. As I was aware of the time left in the round I did not try to take the initiative, which would have lost against double-counter but did nothing but remove his creatures, which made the match end 1-0, and granted me access to the Top 8! I was confident with every matchup in the Top 8, besides the mirror match. As mentioned above those lists were really good against mine, so I hoped they would lose their Quarterfinals matches, allowing me to play easy matchups only. In the first game I kept a hand that is capable of removing multiple creatures and has access to a rescue Force of Will. I stalled the board long enough under a Blood Moon in order to deploy a Counterbalance. 4 basic lands are enough to survive, and a Jace, the Mind Sculptor brought it home after my Angels were being held back by an Ensnaring Bridge. He soon folds to the almighty Jace. The video coverage of this match starts in Game 2, at the 9:11:20 mark of the WotC Twitch.tv stream, embedded below (just click play). In the second game I manage to drop a Counterbalance again, seriously restraining his possibilities of play. I do not fall for his trap and let his Blood Moon resolve, which makes it impossible to lose the game. 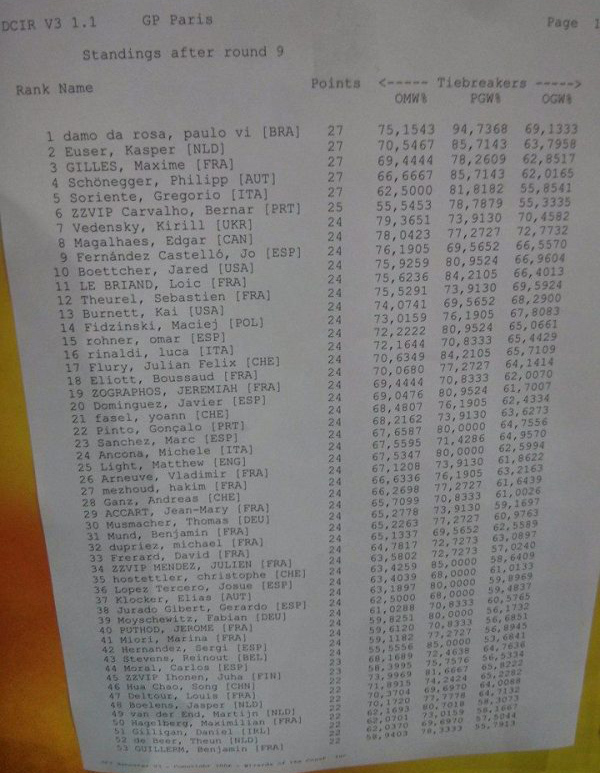 So I am in the Top 4, and while PVDDR lost his match, Maxime Gilles did not. I prayed for not getting paired for the mirror match, but I did. The first game showed exactly why his list is so superior in the mirror. It all came down to a counter war over my Counterbalance, which he managed to win simply due to the fact that his Red Elemental Blasts are hard counters for just one mana. I kept playing for a while, but conceded soon after. In game two I kept a hand with 1 land, 1 Senei’s Divining Top, and tons of Counters. I deployed the Top and looked into it during my Upkeep, yet failed to find a land, and I fell behind so much that I probably could have conceded right away. I kept on playing and tried to resolve a spell here or there – but it didn’t really matter in the end. I congratulated Maxime on the win, and hoped that he would win the GP (which he didn’t, sadly). All in all it was a great tournament, with a lot of very competent yet friendly opponents. Miracles has proven to be a force, and probably the most potent deck as of now. It has no problems handling all the various decks in Legacy’s play environment. Of course there are the rare bad matchups, but losing to fringe decks sounds fair when you have good percentages against nearly everything else. I really hope that this GP will lead to an upswing of Miracles, which is obviously my favorite Legacy deck! With BUG Delver/Team America in the driver’s seat, percentage-wise it was not surprising seeing two of those decks making it to the Top 8. Adding UWR Delver’s high percentage and RUG Delver’s low percentages to this already high amount of Delver decks it seems obvious that the Delver-archetype is once again the most played deck, followed by various StoneBlade variants, followed by Combo. Right in the middle and at second place in this ranking sits Miracles, the deck that provided its pilots three of the eight available Top 8 seats. With good match-ups all over the top tables it isn’t surprising at all, and to be honest – I was hoping for a Miracles-mirror final. The metagame has clearly evolved into True-Name Nemesis (Delver and StoneBlade variants) vs. Miracles vs. Combo. This wasn’t really surprising, as this trend has been realized all over the world and in everybody’s testing. I still hold the opinion that Miracles is at its best in a metagame like this, and seemed clearly the best choice for this Grand Prix. While all of the format was busy hating out creatures with 1 toughness nobody was prepared for a turn 2 Counterbalance. All people thought of was how to beat Nemesis while having a fair game against Combo that they forgot that Miracles existed. Well, they knew it existed, but didn’t really commit enough Sideboard space to it. Even though there was some splash damages by cards like Golgari Charms and the like, nobody had certain slots for this matchup alone, which has clearly helped me going undefeated for so long. The only deck that I did not expect to be that high in the standings was Merfolk. Sure, uncounterable and Islandwalking Nemesis’ are a good thing, but I have always been under the impression that it was somehow impossible to build a good list. It seems I was wrong, as this deck managed to heave 10 of its players into Day 2, which cannot be ignored. 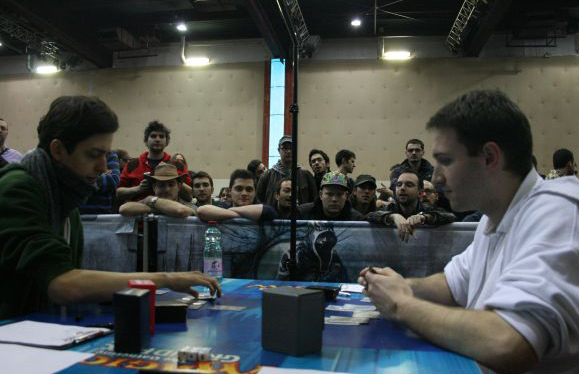 I think GP Paris may also be known as the event in which RUG Delver died. This deck has been a thriving force ever since Delver of Secrets was printed, and shaped the Legacy metagame like no other deck. It has been on the top of the standings for so long it seemed that RUG was actually a fixed part of Legacy. Well, it is not like this anymore. The deck is still played by quite a few people, but has difficult matchups among commonly played decks, and is often outclassed by the other Nemesis decks like UWR Delver and BUG Delver. RUG (as currently constructed) can’t handle a resolved Nemesis, nor can it circumvent a CounterTop lock – two scenarios your deck should be kind of comfortable with in this new metagame. RUG has to counter everything now, despite being good at it this GP showed it very clearly that it is just not able to do so, on a large scale. Rest in peace RUG – at least for some time. There is one last thing I feel forced to talk about. And it’s an unpleasant one. There has been a lot of cheating at this Grand Prix. First some guy got disqualified right before the Top 8 had been announced, which enabled PVDDR to slip into the last seat inside the Top 8. Not much is known about this cheat, but apparently it was for something that happened a few rounds prior to the last round, which begs the question, “why wait until rounds later to DQ the player?” The second incident happened during the Top 8 Semifinals, and was on camera. What many viewers saw in real time was eventual champion Javier Dominguez draw 3 cards with Brainstorm, but quite clearly only put 1 back. It could be a simple mistake, but it could also be a cheat. How do we know? Well, gladly we as the players, are not in the position to judge! Even though many people all over the Internet claim knowing that it was, or was no cheating it makes no difference. We are not the ones to judge. It’s the judge’s task alone, and I trust them at what they are doing. Besides condemning the players for passing on such quick judgments, I think that cheating is a very bad thing for Magic in general, for both the players and the image of our beloved game. But as long as it is kind of worth it to cheat, people will do so. As long as the reward of winning a GP excels the eventual risk they will try again. What I think will be a good countermeasure is stricter penalties. Yes, you can be suspended for a certain time, but I think those times are not long enough, as long as the judges are sure that it is cheating. Upping those suspension and timeframes could be a good countermeasure to alienate those people and provide more of a deterrent from cheating. As of now the DCI has not yet passed a judgment on what will happen, but they have let it be known they are indeed investigating as of that day, and I will await said verdict with tension. I hope you enjoyed my first article here, why don’t you leave your opinion in the comments below? Thank you very much for reading!